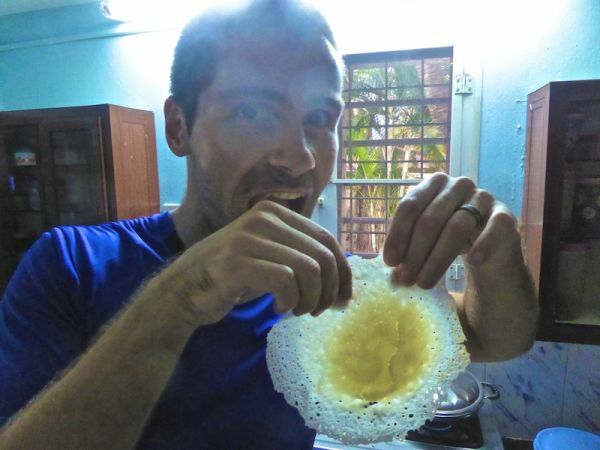 Palappam or ‘appam' is like a pancake, popular in South India and Sri Lanka, made from fermented rice batter and coconut milk.It is usually eaten for breakfast or dinner and as an accompaniment to fish molee. 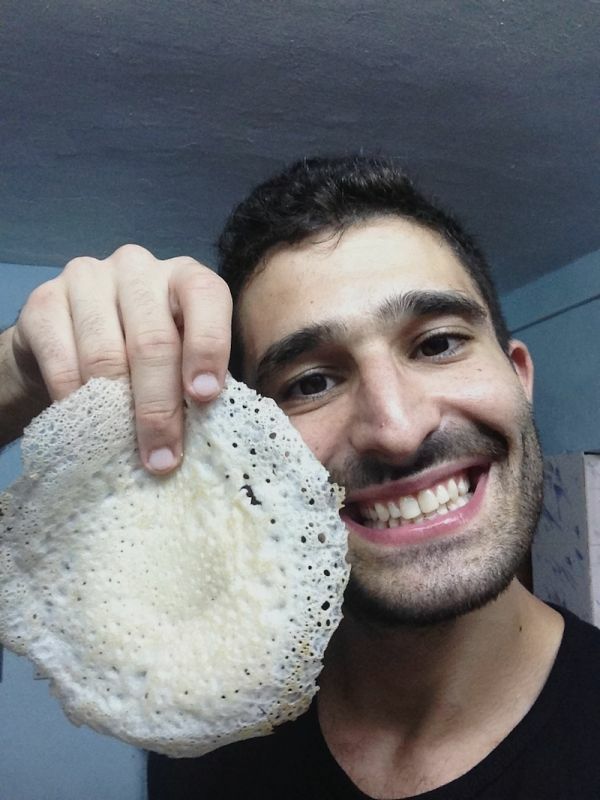 In Sri Lanka palappams are also called “hoppers”. Add 500g of water to 3 tablespoons of semolina and cook it on a low heat, keep stirring it until it starts to look like porridge, then remove from heat and keep aside to cool. Mix 1 teaspoon of yeast in 100g of lukewarm water with 1 teaspoon of sugar until it becomes frothy and leave it aside for around 20 minutes to rise. In a deep bowl, put the 300g of rice flour and mix in the semolina mixture. Mix it well. Add the yeast mixture and mix well. Very slowly add 500g of the coconut milk mixing well as you add it, until you obtain a smooth batter. Cover pan with a tea towel and keep it covered at room temperature over night (not in the fridge). The next morning, retrieve the batter and slowly mix in the remaining 250g of coconut milk, little by little, always stirring. Add a pinch of salt and sugar to taste. Heat a pan then brush a little bit of ghee or cooking oil with a kitchen roll around the hot pan. Using a ladle, scoop in one spoon full of mixture into the centre of the pan and turn the pan round slowly to spread the mixture out so it covers the pan surface. Let the batter cook for around 2 minutes, you do not need to turn it round in the pan. 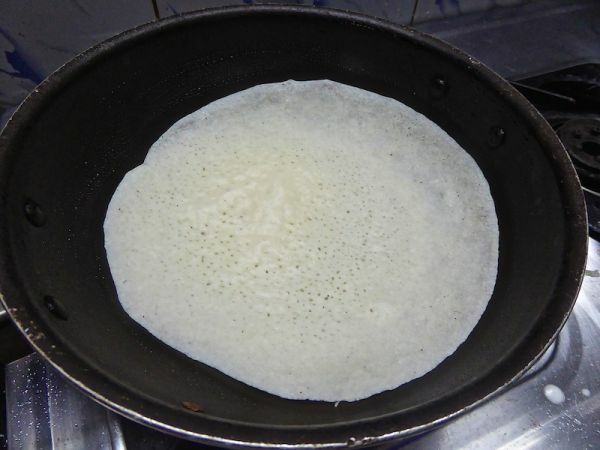 Remove from the heat when the centre of the palappam starts to bubble up a little bit. 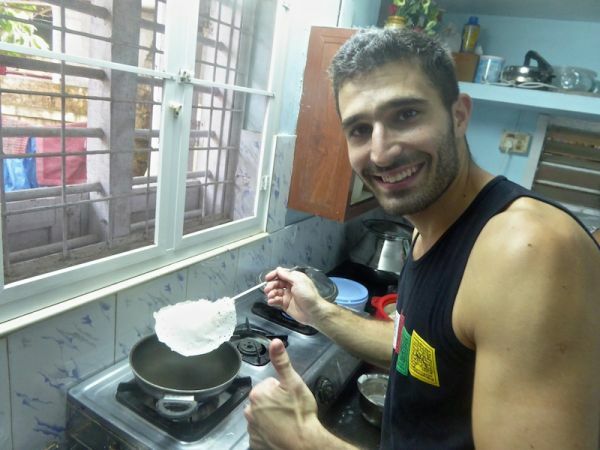 Use the ghee stained kitchen roll to ‘clean' the pan and repeat until all the batter has been used up.